The crew of the Bebop is once again ready to clean up space by bringing bad guys to justice and trying to make some cash while doing it! Back at least in high-definition, this second print run contains a reversible cover as well as containing bonus content never available outside of Japan before including the "Ein's Summer Holiday" short.Special Features Audio Commentaries On Episodes 1, 5, 10, 17 And 24, Japanese Commercials For Cowb..
Own Cowboy Bebop - The Complete Collection DVD from Deff, DVD, Blu-Ray & 4K Video Specialists - Free UK Delivery..
Mars. Days before Halloween 2071. Villains blow up a tanker truck on Highway One, releasing a deadly virus that kills hundreds. Fearing a bigger, even more devastating biochemical attack, an astronomical reward is offered for the arrest and capture of the person behind the destruction. 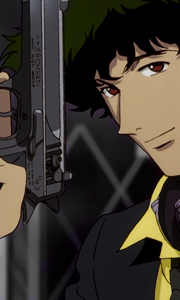 On the spaceship "Bebop," Spike Spiegel and his crew of bounty hunters (Jet Black, Faye Valentine, Ed and Ein) are bored and short of cash. But with the ..